„Fun and easy to do“! Zumba® Fitness became a fast fitness sensation in the US and is suitable for everyone who likes to move to music. A dynamic cardiovascular training which involves walking, hopping and jumping, whereby both feet lift off from ground from time to time. These classes are based on choreographies which improve your condition and coordination. This sudorific training stimulates the circulation. You will step on and off a platform with variably adjustable height to a specific rhythm. Despite the high intensity, you will protect your knee and ankle joints. A cardiovascular training with high heart rate changes. 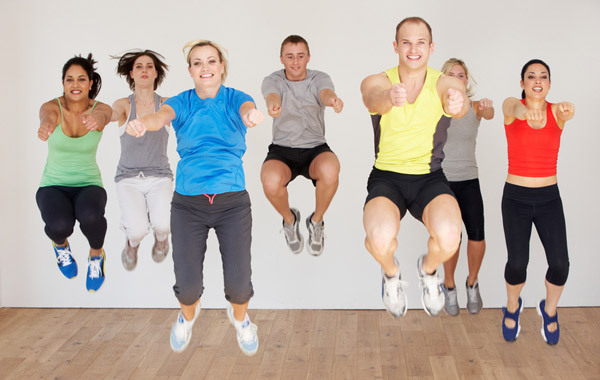 Because of the high intensity, you will burn calories in a coordinated way. A conditionally demanding training in which all muscle groups are used. Tai Bo is based on boxing and includes basic aerobics steps. This program not only exercises all muscles, but also contains a cardiovascular training and burns calories. This is a condition training on special bikes in which beginners and advanced participants can exercise side by side because of different setting options on the bikes. Electrifying music motivates you to simulate uphill und downhill trips through different levels. As a result, you also use the upper-body musculature. You can check your heart rate by means of a special watch.